Attention to detail and quality has made CP Electronics a name to trust. Exceptional reliability has even enabled us to provide a 5 year warranty as standard, on all our products. Our quality management processes dictate strict assembly and test procedures that comply with ISO 9001:2015, and our products carry the CE mark where applicable. 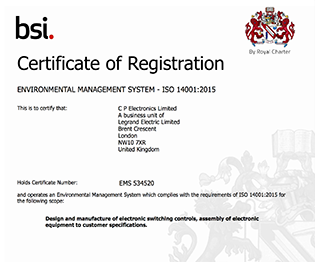 Our environmental management system is accredited to BS EN ISO 14001:2015, and we are active members of the Energy Systems Trade Association (ESTA). Our occupational health and safety management system is accredited to BS OHSAS 18001:2007. 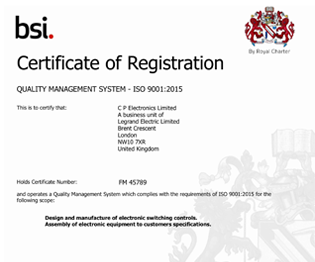 We are certified for the production of BIM Objects and associated Product Data in accordance with BS 8541. 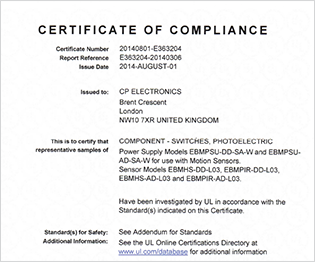 We comply with all UL regulations, and have been UL accredited since 2014. CP Electronics are regular members of the Digital Illumination Interface Alliance (DiiA). The DiiA provides an independently-verified certification program that covers the functionality specified in the latest version of the IEC 62386 family of standards (for digital addressable lighting interface (DALI) technology). The Digital Illumination Interface Alliance is a Partner Program of IEEE-ISTO.